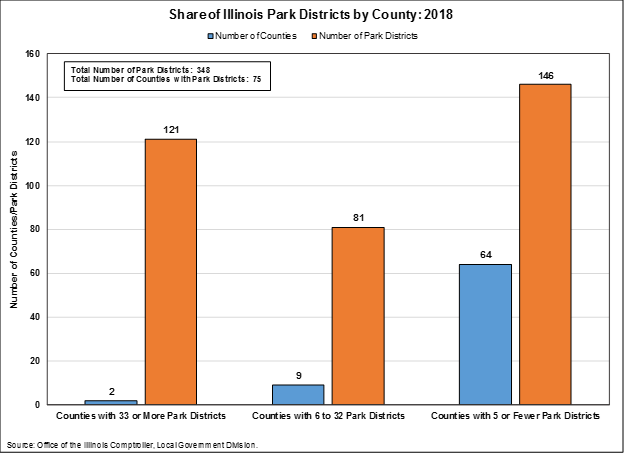 The latest in a series about local governments, this blog post examines the number of park districts in Illinois, including an analysis of the number of park districts by county. The park districts examined in this blog are stand-alone special purpose governments that provide public parks and recreation services and exclude park departments operated by another unit of government such as a municipality. 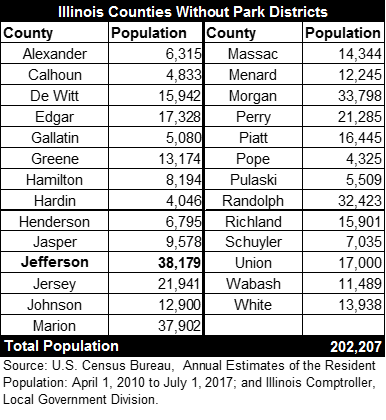 The Civic Federation uses the number of park districts in the State reported by the Illinois Comptroller’s Office as opposed to the U.S. Census Bureau’s 2012 Census of Governments. The Census Bureau uses a broader definition of a parks and recreation district, which includes conservation districts, forest preserve districts and special recreation districts, and therefore reports 397 units, 49 more than the Comptroller’s count of 348. 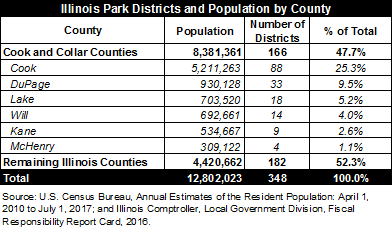 According to the Illinois Comptroller’s Office, 88 of the State’s park districts are located in Cook County, or 25.3% of all park districts in Illinois. As shown in the following table, the five suburban collar counties encompass another 78 districts: DuPage has 33, Kane has nine, Lake has 18, McHenry has four and Will has 14. In total, the six-county northeastern Illinois region has 166 park districts, or 47.7% of all park districts in the State. These counties are also the six most populated, totaling over 8.3 million residents according to the U.S. Census Bureau’s July 1, 2017 estimates. The remaining 64 counties with park districts have five or fewer park districts each. The graph below shows this distribution of park districts by county. There are 27 counties that do not have any stand-alone park districts within their boundaries. The largest of these is Jefferson County with 38,179 residents. The following table lists these counties. Counting governments requires agencies to make choices about how to categorize that can lead to discrepancies. For instance, the Illinois Comptroller tallies 88 park districts in Cook County, whereas the Cook County Clerk’s Office counts 95. This seven-district difference is due to several factors. Six of the districts the County Clerk’s Office includes are park districts that overlap with neighboring counties. These districts are counted by the Comptroller’s Office (and the Civic Federation for purposes of this blog) in those neighboring counties: Burr Ridge, Elmhurst and Oak Brook park districts are included in DuPage County, Barrington and Deerfield park districts are included in Lake County and Frankfort Square Park District is included in Will County. However, since some property taxpayers located in Cook County pay taxes to those districts, they are included in the Cook County Clerk’s count. The seventh is the Westdale Park District, which was dissolved in 2006 into the Parks and Recreation Department of Leyden Township but still has a property tax levy. Some park districts located in Cook County serve the residents of multiple municipalities and unincorporated areas or only a portion of a municipality. For instance, Pleasant Dale Park District covers parts of Burr Ridge, Countryside, Indian Head Park and Willow Springs as well unincorporated areas of La Grange and Hinsdale. Similarly the Homewood-Flossmoor Park District serves both the communities of Homewood and Flossmoor. There are municipalities in Cook County that have a parks department and therefore are not included in the list of park districts. Evanston has its own parks and recreation department in addition to two other stand-alone park districts within its municipal borders. The Ridgeville Park District provides park services in much of Evanston’s southern portion, whereas the Evanston Lighthouse Park District maintains a lighthouse and a small area surrounding it on the coast of Lake Michigan. A forthcoming report by the Civic Federation will provide similar analysis on all local governments in Illinois. Illinois also has five conservation districts, eleven forest preservation districts and two special recreation districts according to the Comptroller’s Office. The Cook County Clerk tallies 94 “suburban park districts,” which excludes the Chicago Park District. The Federation added the Chicago Park District to its tally for a total of 95. Per Pleasant Dale Park District’s website: http://pleasantdaleparks.org/pages/parks-and-facilities.html (last accessed September 18, 2018). Per Homewood-Flossmoor Park District’s website: http://www.hfparks.com/profile/ (last accessed September 18, 2018). E.g., the villages of Glenwood, Lincolnwood, Palos Park, Orland Park and Orland Hills.